Big Skinny Wallets are sleek performance wallets that are great for travel or everyday use. Thinner and lighter than leather and other materials, they are smartly designed for functionality and storage, and are machine washable, too. Dimensions: 7.5" x 4" x 0.27"
So lightweight!! Fits everything I need and more. Love this slim line billfold! I have tried many different billfolds and now have found one that I love. It is slim, colorful and very roomy. I love that it has a coin section as well as the two cash slots. It also has the perfect number of slots for ID and cards. It is truly “skinny” and even fits into my smaller purses. Good looking, slim, and functional. That’s the story behind every Big Skinny wallet. 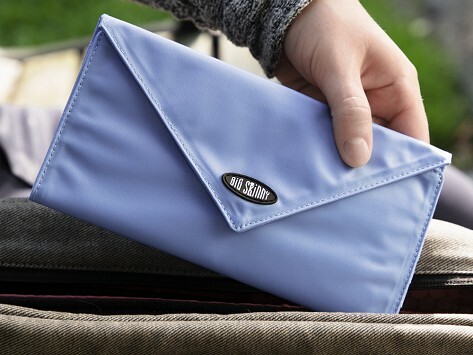 Sleek and silky to the touch, the durable nylon micro-fiber shrinks the space needed by a traditional wallet. Its material is at least five times thinner than leather, meaning a Big Skinny is just 1/10 the thickness of a folded leather wallet. Big Skinny’s advanced nylon micro-fiber is durable, looks beautiful, and has a satiny feel. Kiril was inspired by an Italian luxury fashion house, who used a similar fabric for their globally popular tote bags. On top of their aesthetic attributes, Big Skinny wallets are water resistant and machine washable, too. Kiss your bulky billfold goodbye, and your pocket or purse will thank you.